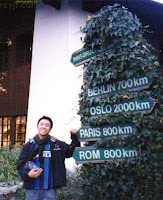 I was in Paris, France in November of 2004. I remember the weather was nice despite it being so cold - I wasn't used to 7degC-at-noon days. I remember the long French bread that sticks out of the paper bags of grocers, and the wonderful cobblestone roads. I remember we stayed at probably the best aparment Paris can offer - not because it was extravagant or anything of the sort, but because it was with a very accommodating French lady lawyer called Marie. She was our gracious host during our stay in Paris. If you're interested in finding places to stay in Paris, check these out too apartment cannes and apartment venice. Venice, of course is in Italy, and will be the topic of another post! I remember getting coffee at a French coffee shop while waiting for our hosts to arrive. At that time, it felt like I splurged on my coffee cup haha. 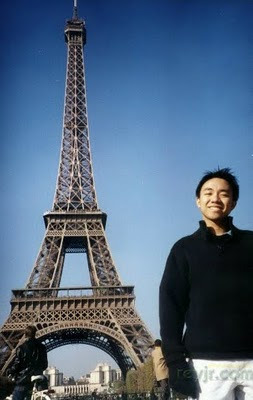 I remember the feeling I had when I first saw the Eiffel Tower. I was giddy with excitement and I couldn't understand why. :p We didn't get a chance to go up the tower though - the line was really REALLY long, and we needed to go and cover more ground because we had limited time. The Arc was under rehabilitation at the time, that's why part of it was covered. 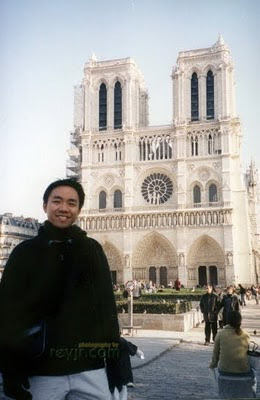 I remember wanting to burst into song at the sight of the Notre Dame Church, and wondering if they really had a Quasimodo ringing the bells. Lol! Trivia question: Did you fall in love while in Paris? Nice photos, Rey! Mine are kind of embarassing now because of some of my clothes and my fat face! Hahahaha, but yeah I had some great memories of Paris. More tour stories! 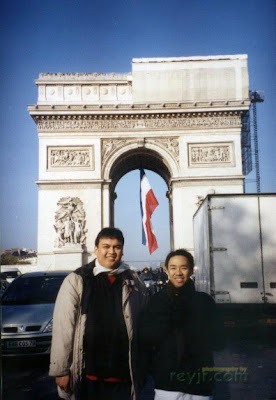 Ang lamig naman, I can't stand very cold temperatures...brrrr....kahit Baguio lang ... masarap pa rin ang temperate climate...lol...but it would be good to visit Paris someday. The most romantic city. Haha! I didn't want them to panic and think I was in trouble in the bathroom - they might tear down the door and just see me standing naked under the shower. hahaha! What a question! Haha. The answer is I was already in love before I went to Paris. Ayihee! What is that movie about? Remind me! Hi Mam @Jenaisle - it really is a romantic city with all the flowers, the fountains and the parks. Even the air seemed different there. Bata ka pang tingnan diyan! Naks naman... Hay! Gusto kong makapunta diyan! Sulat ka sa wish ko lang, ako din susulat at gusto ko makabalik doon. :D Sana hindi nila tayo kantahan ng... "Mangarap kaaaa! Mangarap ka..."
really a nice movie, with a nice OST :) - Love Will Show You Everything. i have never been to europe yet but i'd like to!